Univ Of Minnesota Press, 9780816689323, 304pp. For Kate Hopper, pregnancy is downright unpleasant. She is tired and heavy and worried, and she wants her wine and caffeine back. But then, at a routine checkup, her doctor frowns at her chart and says, “I’m worried about a couple of things”—and unpleasant suddenly seems like paradise. What follows is a harrowing, poignant, and occasionally hysterical journey through premature motherhood, from the starting point of “leaking a little protein” to the early delivery of her tiny daughter because of severe preeclampsia and the beginning of a new chapter of frightful, lifelong love. Half a million babies are born prematurely in the United States every year—almost one every minute—each with a unique story, and Hopper eloquently gives a voice to what their parents share: the shock, the scares, the lonely nights in the neonatal intensive care unit, the fierce attention to detail that makes for sanity and craziness, the light of faith, the warmth of family, and the terrifying attachment. Through it all runs the power of words to connect us to one another, as Hopper draws on her gifts as a writer first to help her navigate this uncertain territory and then to tell her story. With candor, grace, and a healthy dose of humor, she takes us into the final weeks of her pregnancy, the this-was-not-part-of-the-plan first weeks of little Stella’s life, and the isolated world she and her husband inhabited when they took their daughter home at the onset of a cold Minnesota winter. Finally, frankly, Hopper ventures into the complicated question of whether to have another child. 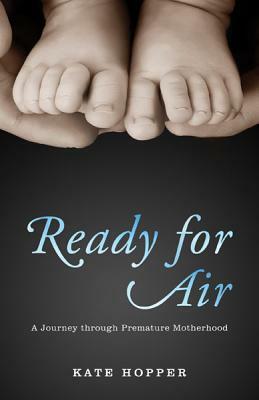 Down-to-earth and honest about the hard realities of having a baby, as well as the true joys, Ready for Air is a testament to the strength of motherhood—and stories—to transform lives. Kate Hopper teaches writing online and at the Loft Literary Center in Minneapolis, where she lives with her husband and two daughters. She holds an MFA from the University of Minnesota. She is the author of Use Your Words: A Writing Guide for Mothers and an editor at Literary Mama. For more information about her writing and classes, visit http://www.katehopper.com.